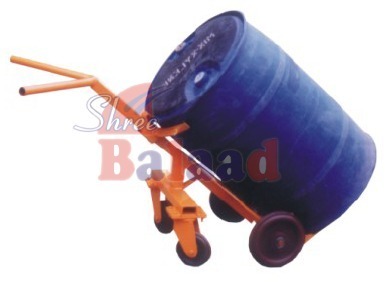 Leading Manufacturer of drum jockey, electric drum tilter, three wheel drum trolley, four wheel drum trolley, scooter tyre drum trolley and drum hander from Ahmedabad. The lifting of the drum can be made by Manual operated Hydraulic Systems. One gearbox is provided to rotate the Drum. After lifting the Drum hydraulically the Drum can be rotated up to required angle max 180 Degrees by turning the handle. Can be used in loading & unloading the Drums in the truck. Can stack the Drums horizontally one over the other. Can tilt 180 Degrees for pouring liquid to the last drop. Can carry Drums to long distance. It is quite a one-man show, the Drum need not be touched by hand. Can handle steel & Plastic Drums, as well. This is the ultimate solution for quick, safe & fast Drum Handling in warehouses & plants. 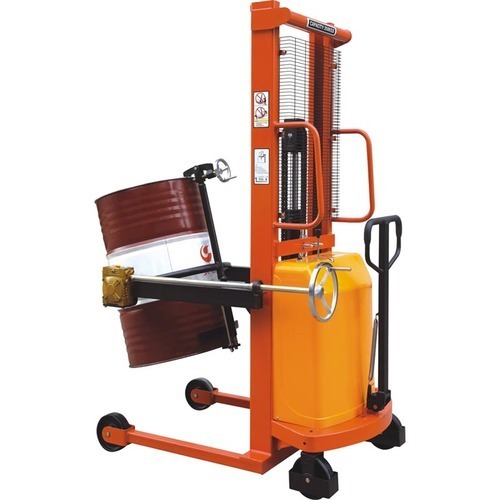 The lifting of the drum can be made by Electric operated Hydraulic Systems. 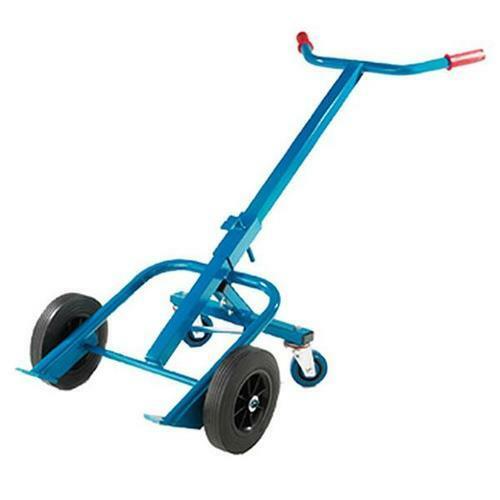 3- Wheeler Drum trolley for better control & more safety. 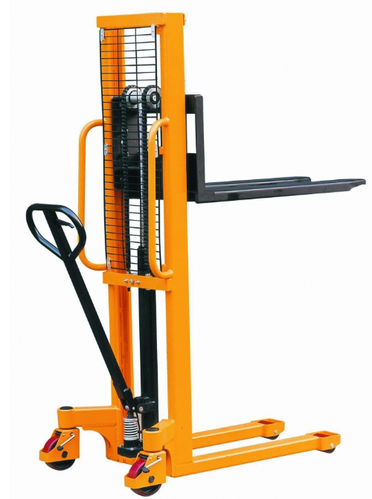 For easy lifting, shifting and transporting of all 210 litres plastic & M.S. drums. One man can handles all. 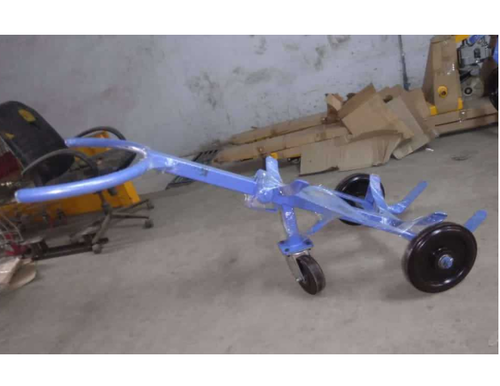 4- Wheeler Drum trolley for better control & more safety. Wheels Option Pneumatic Wheels . Zero maintenance, easy to operate. 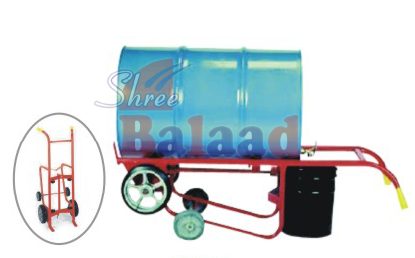 4- Wheeler barrel trolley for best control, more safety, easy to operate. 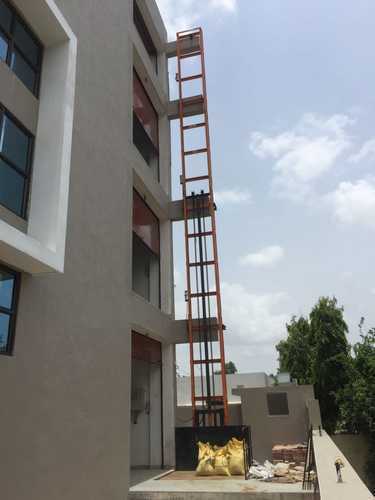 For lifting, shifting of all 210 liters Plastic & M.S. drum handling needs. 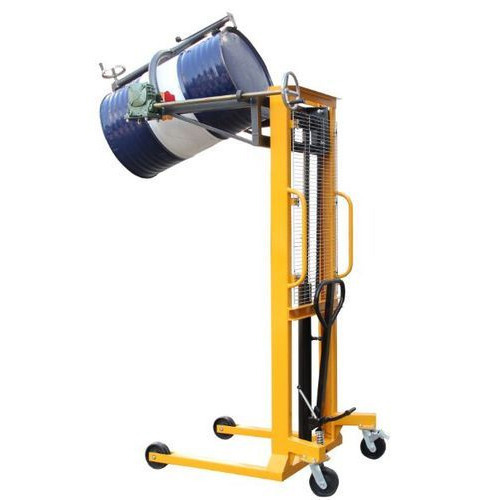 Multi-functional drum truck allows you to move drums on four wheels and acts as a drum cradle for storage and dispensing. White virgin rollers allow for easy faucet positioning of drums. Dully power coated & ready for use. 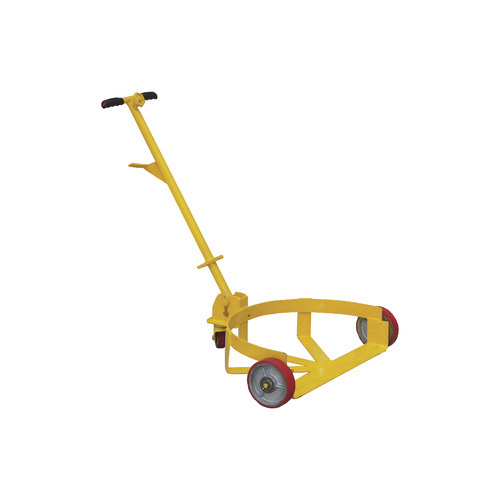 A convenient hand-operated pump controls a hydraulic cylinder, which does the lifting for you. Move your drums without heavy lifting Std. Size: 24” dia for std. drum x 4” Ht. Structure made from 50 X 5 mm M.S. Flat . 1 Nos. M.S. Pipe pulling handle for easy carrying. Wheel Size : 3” x 1.5” with Swelling castor. Put your drum or barrel on wheels-provides safe and economical drum handing. 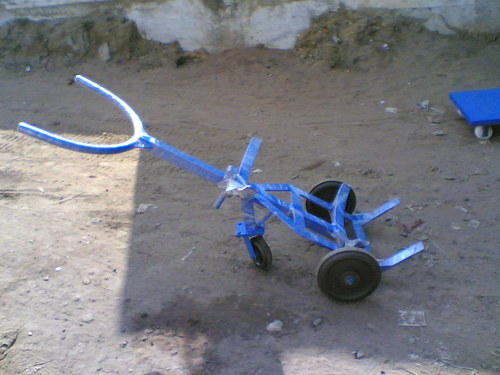 All-welded steel frame handles loads up to 300 Kgs. All swivel casters ensure extreme mobility. 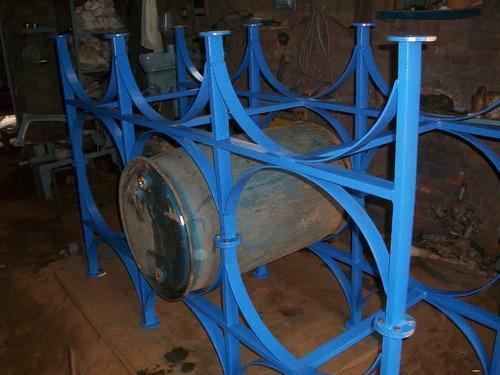 Various construction, design, caster type and sizes to accommodate your application. Dully power coated & ready for use. Stacking Drum/Barrel Racks make handling of drums easier, faster, more organized, and safer. These all welded Portable Drum Racks allow use of forklift to move and store drums - saving time and Man power. Front and back fork entry makes them easy to move. Drum racks is designed to store two/three drum per stand & can be stacked up to 3 high. This handling and storage method gives complete flexibility. The Drum rack is made in a standard size only for standard drums. 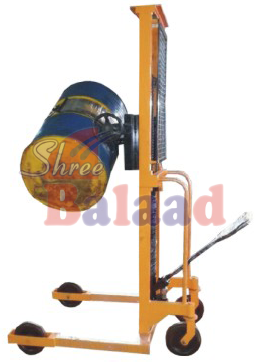 Lifting of drum can be made by Manual operated Hydraulic Systems. One gear box is provided to rotate the Drum. After lifting the Drum hydraulically the Drum can be rotated up to required angle max 180 Degrees by turning the handle. It is quite a one man show, the Drum need not be touched by hand. Reel Stacker offered provide for easy support for lifting reels. 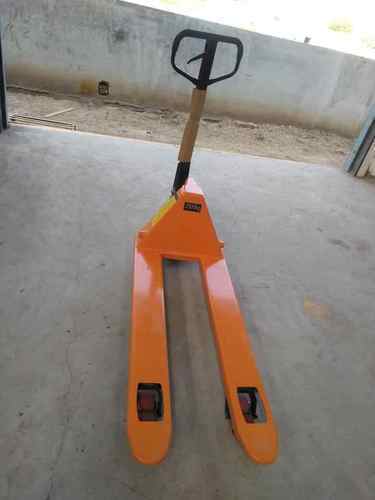 We are a trustworthy organization in the market, actively engrossed in offering a wide gamut of Pallet Truck. 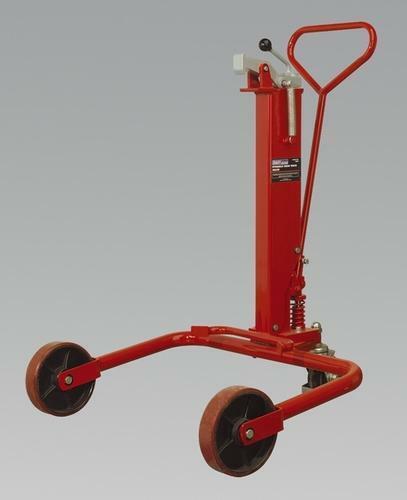 Looking for “Drum Loading Equipment”?